Most of astronomy is done with light. That requires a wide variety of telescopes, depending on the type of light and the kind of observation to be performed. 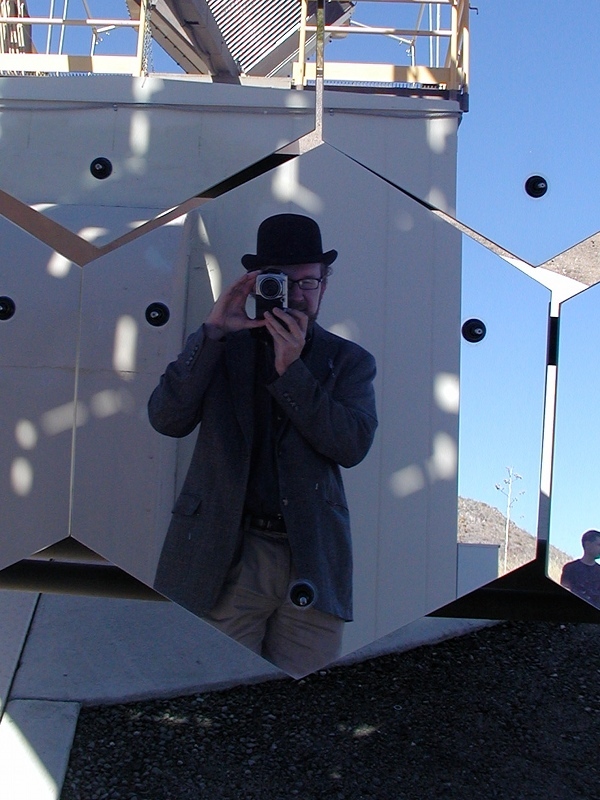 X-ray astronomy is very different than radio astronomy, and observatories dedicated to measuring spectra often have different requirements than those dedicated to taking images. For some types of light, Earth’s atmosphere itself is an impediment: gamma rays, X-rays, and many frequencies of infrared and ultraviolet are blocked by atoms and molecules. However, some gamma ray astronomy can be done even on Earth. Gamma rays are the highest-energy radiation, coming from a variety of sources; most we see likely originate in shock waves in supernova remnants. Some photons are even powerful enough to mess up atomic nuclei if they score a direct hit. Most gamma rays from space are scattered from molecules in the upper atmosphere (a good thing, since they can be very damaging to cells and DNA). However, before they are stopped, some gamma ray photons can be detected. The telescope above (and in the photo at the right) is one of four 12-meter-diameter telescopes of the Very Energetic Radiation Imaging Telescope Array System (VERITAS). 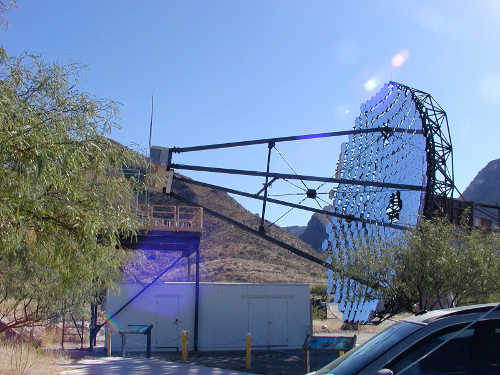 You have to try to get to this observatory: it’s in the Sonoran Desert in southern Arizona. I visited the facility last year as background research for my (now-dead) book. The large size of the telescopes is necessary because they need to collect enough photons to see anything at all; four telescopes help pinpoint the direction the gamma rays came from. The Cherenkov light is faint enough that it can only be seen at night; the astronomers working at VERITAS require at least two of the telescopes to see a shower of photons before they consider it a detection. This is a very sensitive observatory!